A good, systematically ordened collection, in which each fossil is catalogued and the collection is accompanied by a database with all information regarding the fossils is not only the pride of the collector, but also extremely valuable. Not in the financial meaning of the word, but valuable for educational and scientific purposes. Working on a systematic collection means a lot of work and sometimes we prefer to work in the field. Despite that, working on a good collection is something you musn't forget. A well build collection is the crowning glory of many hours of searching, preparing and determining fossils. You can store a lot of fossils this cabinet. When you start building a collection you usually don't focus on a specific era or taxonomic group. Exceptions are collectors who start to collect at one specific location, often close to home. After a while most collectors specialize, some horizontally (for example fossils from the Upper Cretaceous or fossils from one locality) or vertically (focus on a taxonomic group like sharkteeth or ammonites) or even both (for example Ordovician trilobites). In other words, you specialize thematically. There are more kinds of specialisations, like collecting pathological fossils or trace fossils. Specializing is a condition to be able to build a good collection, a conditio sine qua non to reach a high level of knowledge and to be able to contribute scientifically. It is nearly impossible to build a complete collection that has all taxonomic groups from all eras. Even when you have a broad interest it is wise to focus on a specific theme and specialize. When storing fossils it is important to pay attention to the conditions in the room where you store your fossils. Of course you want them to be in perfect condition ten or more years from now. Sunlight, changes in temperature and damp are some things you have to control. Fossils are best stored in a room that is not too damp, has a constant temperature, is dustfree and protected from sunlight. Drawers and cardboard boxes which you can fold are ideal to store fossils systematically. The storage system needs to offer room for systematics, you have to be able to label your system: sturdy drawers or boxes which you can pile up are ideal storage. Keep in mind the weight of the fossils that the boxes or drawers have to support. You can use storage cabinets with shelves that can support considerable weight. Within each drawer or box you have to be able to store systematially. 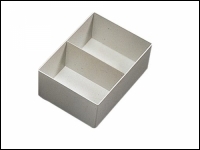 For this micromount boxes and cardboard folding boxes are very useful. Keep in mind that the boxes need to be made from acid-free cardboard or some other sustainable material, otherwise they will fall apart after a while. Give each individual drawer or box a unique number. A smart folding box system makes it possible to arrange each drawer the way you like. Each fossil is best stored in a single box or compartiment of a box and provided with a number for registration. This number is preferably written on the fossil and on the box if necessary. This number is a link between the fossil and the information about the fossil in the database of the collection. TIP: when you buy boxes choose sizes that are multiples of each other so they will fit in the drawers more easily and you can check if they fit before you put them all in the drawer. Choose boxes with sizes that are multiples of each other. When you have enough room a display case is a nice way to display your best finds. Check if the case is dustfree. Lightning in the showcase can give a nice effect. Make sure that important data like the locality where you found the fossil doesn't get lost when you display your fossil. A way of avoiding that is providing you fossil with a number. Putting a small label with each fossil can be sufficient for a very small collection, but even in small collections this could lead to loss of information. One thing is sure, never trust you memory ('I will remeber this'). What you need is a good 'workflow' to catalogue the information you collect in the field and put it in a database when you come home, without losing the connection between the fossil and the information. 2. At home: find a place to store your fossils temporarily, awaiting preparation, conservation and determining. You can use the same reference system as in the field. Store all information together with the fossil. Create a record in your database with the same registration number and fill in all the information you have. Give your fossil a place in your collection and register this place in your database by giving each drawer or box a unique number. It is important how you put the number on your fossil. Pay attention to the lasting nature of the materials you use. After a while a piece of paper can fall apart, texts can fade away and stickers can fall of. When you use archival pens or ink your notes will last longer. Here you see a registration number written on the fossil itself. In fthe past people used to write the number on a white stripe of correction fluid painted on the fossil. This white layer becomes brittle after a while, so this is not a technique we would recommend. The method used in most musea is painting a small stipe of varnish (don't use a varnish that grows yellow) on the fossil. The number is written on the layer of varnish with a achival pen or ink and covered with another layer of varnish. This works well. A plain card-index box or list is a good and easy way to keep track of your fossils, but a database in a computer has many advantages. You can browse the system in a more flexible way, add pictures, add links to maps using coordinates, print labels, etc. There are several types of database software especially made to catalogue fossils. Some of these systems can save you a lot of time. Make a back-up regularly! You should a least register the following data, because a fossil without this information is useless for scientific purposes and for most collectors. Sadly a lot of beautiful and large collections in which a collector has put a lot of time and effort end up in garbage bags, get lost in storage or get split up after the collector passes away. It is important to decide what will happen to your collection when you die. Maybe you want a family member to inherit your collection or another collector who can continue to work on your collection? Maybe there are specimens in your collection that have scientific value? With a large or valuable collection it is wise to record what will happen to it in a testament. Collectors: record what will happen to your collection after you die and discuss this with the people around you.